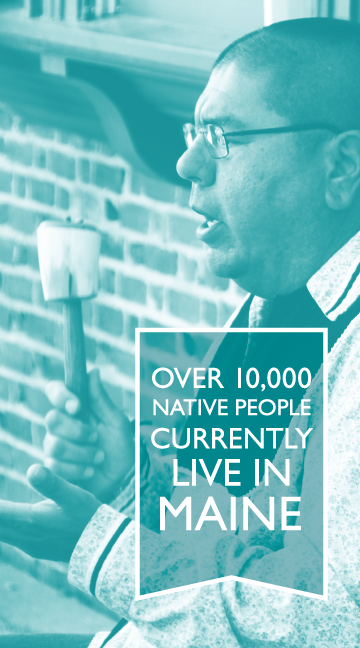 Over 10,000 Native people currently live in Maine. Most are Wabanaki – a confederacy of Nations that today consists of the four federally recognized tribes in Maine: Penobscot, Passamaquoddy, Micmac, and Maliseet. In addition, the Wabanaki includes several bands of the Abenaki tribe, located primarily in New Hampshire, Vermont, and Quebec. The five Wabanaki communities in Maine elect officials, have social services, and also participate in Maine political and social life, most notably as leaders in environmental management. The Wabanaki retain language (at differing rates) and cultural values and are, like many Native communities, striving to ensure that younger generations know and understand their history and traditions. In what is known as the encampment period, from about 1840 to 1920, Wabanaki lived like the other residents of Maine, speaking English but retaining cultural values, language, and limited privileges. Artists and craftsmen would travel to tourist areas, like Bar Harbor, in the summer to sell baskets and other items supplementing their income. They offered guiding services and other services and performances of traditional music and dance. The purchasers were the seasonal residents known as “rusticators” – people like Dr. Abbe and his colleagues who were drawn to the natural beauty of the Maine coast. These summer encampments were both the tribal members’ homes and retail outlets. Bringing people together at the encampments and the market for Native baskets and other goods helped to sustain Native culture and community. When the encampment period ended, Wabanaki became largely invisible to non-Native Maine, but they continued to live in their communities, sustaining their cultures.